I run Waterbabies, the number one leading baby swim school in the world. We teach 20 different Chapters for young swimmers, all the way from tiny babies and toddlers to children of around five years’ old. All of our teachers are trained to diploma level, and we have around 900 babies and toddlers in total attending our classes in the North East. We’ve been hirers at The Education Village for over ten years now and more recently, Durham Trinity School – both are lovely places to be. Absolutely yes, it’s been invaluable! By hiring facilities from The Education Village we’re able to use so many different things we wouldn’t have had otherwise, including a hydrotherapy pool, which enables babies to swim instantly from birth. It’s also given us opportunities to have both weekend and weekday classes, enabling us to run a real variety of different classes at various levels. We’ve really been able to take advantage of all the different options out there. 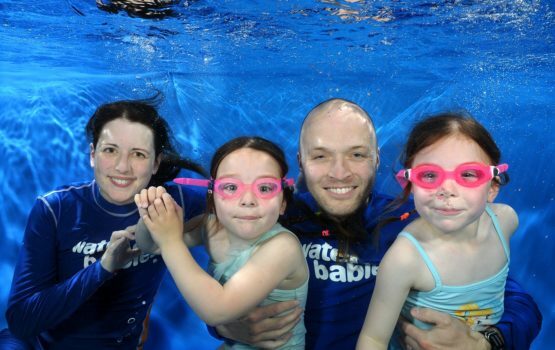 One of our most special events, is our termly underwater baby photoshoot at the venue for babies who have completed their chapter 1 swimming course. We hire both the hydrotherapy pool and the school’s dance hall at the weekend, which allows everything to happen in one venue. The pool is of course used to do the photoshoot, and the dance hall is used for parents to view the photos of their babies swimming in the pool. It’s a really lovely event. The team at Kajima are always brilliant and they help us wherever they can. Everyone there is approachable, friendly and helpful and it’s so easy to manage our account with them – we’d really recommend it.